There was local success at the annual London Cycling Campaign awards announced on 16 July 2014. Tower Hamlets BMX Club was chosen as Youth Section Cycling Champion. Based in Mile End Park, they meet at the pump track every Saturday. Non-members and those without a bike welcome. Art Spokes is a local social enterprise set up by Sarah Hammond in 2012 providing creative workshops for primary schools. 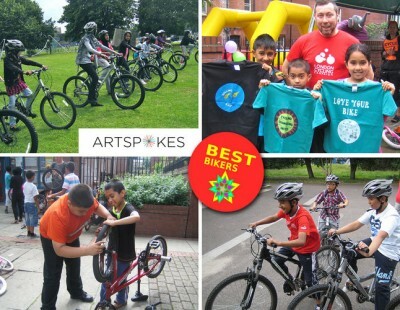 Their star project, Best Bikers for children, puts "cycling, the environment and healthy living centre stage of the school" whilst "helping promote a cycling culture and positive attitudes towards active travel and healthy life styles amongst their peers, staff and parents". 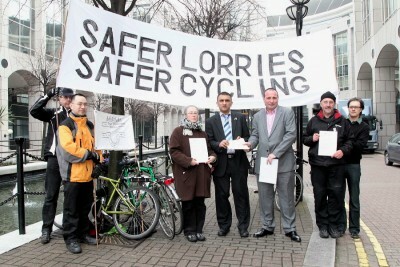 Representatives from Tower Hamlets Wheelers and the London Cycling Campaign (LCC) today urged LB Tower Hamlets to publicly engage and lead on reducing the danger from lorries in the borough. Meeting outside the Town Hall, a letter was handed to Councillor Shahid Ali, Cabinet Member for Environment and Jamie Blake, Director Public Realm asking for the council's support of the LCC's Safer Lorries, Safer Cycling pledge. Lorry crashes are the number one cause of cyclist fatalities. Please write to your council today (using the online tool at lcc.org.uk/pages/safer-lorries) to help reduce the death toll on our streets. The London Cycling Campaign has released a progress report on its Safer Lorries, Safer Cycling campaign and it's not good reading for those cycling in Tower Hamlets. Our council has been given the lowest possible mark for their inaction on committing to use the safest lorries and best-trained drivers.